Hello! I am Sabina Khan and I will be your host for this leg of the hunt. And puppies. When I’m rich and famous I want to rescue puppies and cuddle them all day. I love to learn languages: Currently I speak German, Bengali, Urdu, Hindi and of course English. I’m mastering the art of procrastination in writing by learning Spanish online. While I was writing my first book I made two new best friends: gummy worms and vodka. But enough about me. 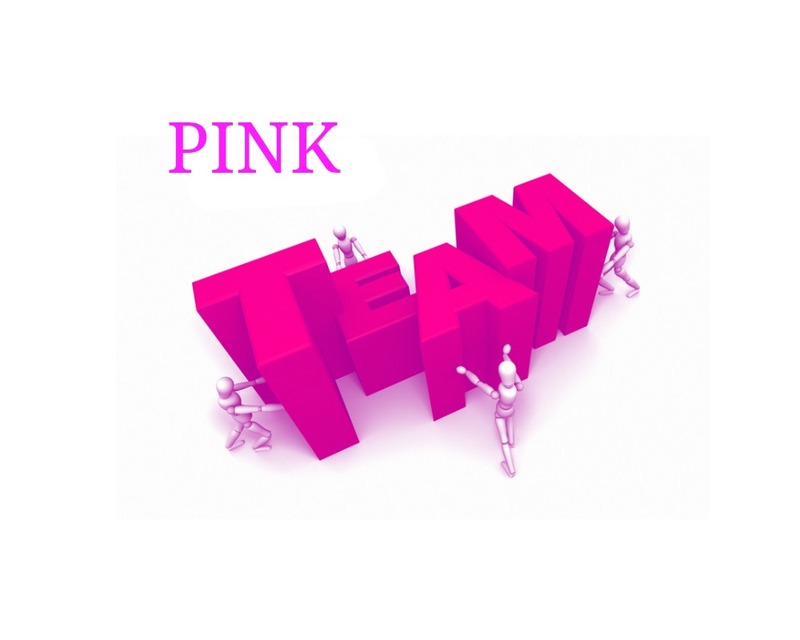 You are currently hunting on the Pink Team! Go to the YA Scavenger Hunt page to find out all about the hunt. There are SIX contests going on simultaneously, and you can enter one or all! I am a part of the PINK TEAM–but there is also a red team, a gold team, an orange team, a blue team,a teal team, a purple team and a green team for a chance to win a whole different set of signed books! Directions: Below, somewhere in this post, you’ll notice that I’ve listed my favorite number. Collect the favorite numbers of all the authors on the pink team, and then add them up (don’t worry, you can use a calculator!). Rules: Open internationally, anyone below the age of 18 should have a parent or guardian’s permission to enter. To be eligible for the grand prize, you must submit the completed entry form by Oct 4 at noon Pacific Time. Entries sent without the correct number or without contact information will not be considered. 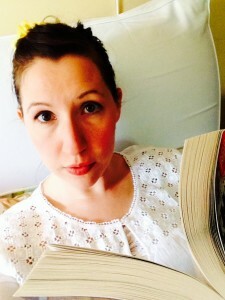 Today I’m thrilled to be hosting the fabulous Kate Karyus Quinn for the YA Scavenger Hunt. Kate Karyus Quinn is an avid reader and menthol chapstick addict. She has lived in California and Tennessee, but recently made the move back to her hometown of Buffalo, New York, with her husband and two children in tow. She promised them wonderful people, amazing food, and weather that would… build character. She is the author of ANOTHER LITTLE PIECE, (DON’T YOU) FORGET ABOUT ME, and the upcoming DOWN WITH THE SHINE (April 16th, 2016) all from HarperTeen. Even the lightest hearts have shaded corners to hide the black thoughts that come at night. 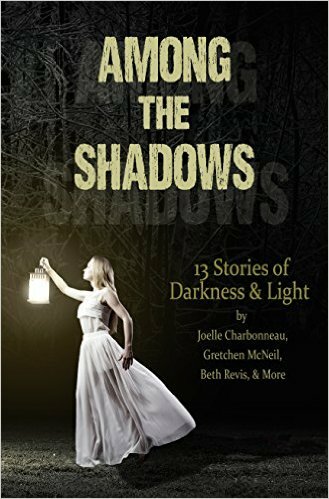 Experience the darker side of young adult as 13 authors explore the places that others prefer to leave among the shadows. Including stories from: Lenore Appelhans, Joelle Charbonneau, Kelly Fiore, Geoffrey Girard, Justina Ireland, Lydia Kang, RC Lewis, Demitria Lunetta, Mindy McGinnis, Gretchen McNeil, Phoebe North, Kate Karyus Quinn, and Beth Revis. Everyone has their breaking point. Turns out mine is having my father return from the dead. I come home from school and there he is standing with Mother in the middle of the living room. His arm draped along her shoulders. Hers around his waist. They can’t possibly be comfortable. It looks as if they’re posing for a picture, and I can’t help but wonder how long they’ve been waiting here. But then again they never do seem quite at ease when they’re together. “Miranda, isn’t this a surprise?” my mother squeals, proving once again that she has mastered the art of the understatement. It’s a shame they don’t hand out trophies for that type of thing. “I hate surprises,” I answer. Which is true and which she would know if she paid the least bit of attention to me beyond what I’m wearing and how many times I’ve frowned (“Always aim for a zero frowny face day!”). My distrust of surprises goes all the way back to my fifth birthday party. It was on that bright and sunny day when I received a beautiful pink pony, her flowing mane braided and bowed. She was the most wonderful thing I’d ever seen and she was all mine to keep forever and always. In that first glimpse of her I imagined us having a million different adventures together. My love was instant and complete. So I waited and waited until at last it was my turn. Of course, my parents had to make it a big production. As I approached the pony, a carrot clutched in my fist, all the other kids circled around, clapping and cheering. Just as I stretched out a hand to stroke her velvety soft nose, there was a terrible rumbling sound. And then the beautiful pink pony spontaneously combusted. So when someone mentions a surprise, perhaps it is inevitable that it always makes me think of being spattered with pink pony guts and the feel of them dripping off my face while all around me my friends screamed and screamed and screamed. This then is why I don’t rush to hug and kiss my long-lost father. One never knows who might blow up next. Also, I rather hate him. I’d been told not to say such things when he was dead, but seeing as how he’s miraculously resurrected, it looks like hating him is back on the table again. Trust me, I have my reasons for it. A year ago I caught him getting it on with Miss Gruber. Even naked I recognized her immediately. She’d been my teacher for kindergarten and then again in third grade. I’d had fond memories of her. She was always so encouraging. “Good job, sweetie,” she’d say to everyone, even the kids who were doing a terrible job. With my father it was more of a “Yes, yes, just like that, sweetie baby,” but the chirpy tone of encouragement was grossly familiar. Really, it wasn’t the cheating that had bothered me. I’d never believed my parents were in love or even particularly liked each other. But all that naked shaking flesh was unpleasant. 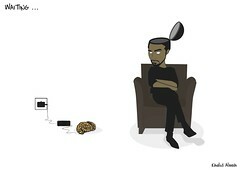 Worse yet was my father announcing, “I’m sorry you walked in on me having relations with a woman who is clearly not your mother.” Sometimes my father talked like he had a robot living inside him. Maybe that’s why he’s alive again. Anyway, after he’d gotten dressed and sent Miss Gruber home we’d had a talk. He apologized and said he’d done things he wasn’t proud of. A few tears had fallen (his, not mine; it’s been years since I’ve given anyone the satisfaction of seeing me cry) and he’d quickly wiped them away. Then he asked if I was still his “little kitten?” I’d known the correct answer was, “Yes, of course.” But honestly, had I ever been his little kitten? I had vague memories of him saying it once or twice when I was younger. Almost as if he was trying it out. But for him to bring it back after all this time . . .
“Kitten!” he exclaims now, apparently reading my mind, except not the part of it that thinks his nickname for me is gross and wrong. “Surprise!” Mother says once more. I stare at my parents. These two strange slippery people that seem less knowable and more changeable the older I get. Oh I love them, of course. I suppose. But dear gods, I’d have given anything to know that I wouldn’t have to share the same small town with them for the rest of my life. We all stare at each other as the clock loudly ticks the seconds. None of us spontaneously combust. I try not to be disappointed. Wasn’t that awesome? 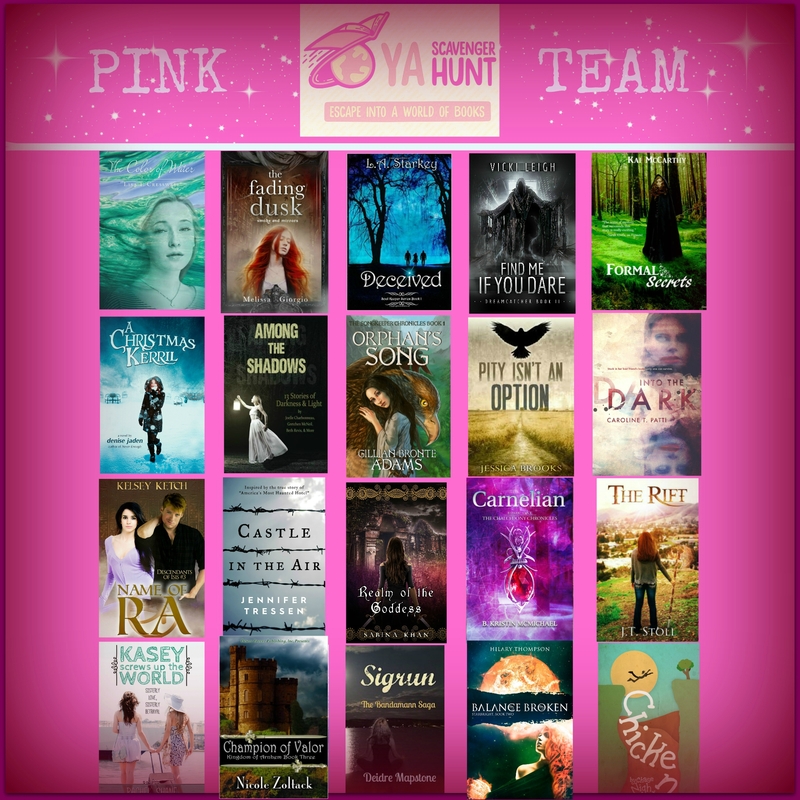 Check out all the authors on the 8 teams in the Scavenger Hunt and discover your new favorites! To enter, you need to know that my favorite number is…8. Add up all the favorite numbers of the authors on the pink team and you’ll have all the secret code to enter for the grand prize! Thank you so much for visiting my website! While you’re here, don’t forget to enter the bonus draw I am running exclusively during the YA Scavenger Hunt. -Comment on this blog: Who is your favourite goddess from any mythology and why? For the bonus contest I will be giving away Ebook copies of my book REALM OF THE GODDESS. My never-ending quest for permanent weight loss finally landed me kicking and screaming in a fitness club. Okay, so I wasn’t actually kicking or screaming, but it did take a lot of cajoling to get there. I love the people that work in these places (sarcasm intended). They are so transparent in their attempts to reel you in. The lady that was helping me was clearly new and throughout the whole process, she kept trying to convince me to get my husband to join too. Now I must point out that this was a women’s only gym, so of course I was perplexed. She did mention afterward that they had co-ed clubs as well, which did nothing to quell my irritation, seeing as we were there to talk about me. She then proceeded to tell me that I had to be assessed, so that I would know exactly what my fitness level was. And that I would have to pay for it. 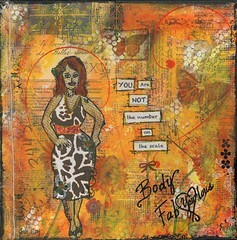 I could have told her that my fitness was negative on whatever scale they used. I could have told her that for free. But she insisted that they had to measure every inch of excess fat, and my body mass index and how much weight and how many inches I had to lose. I tried to tell her that if they did all that I would probably go home and kill myself and then how would they get their monthly dues. But the newbie was tenacious, she would not let go until I agreed. So now I have to come up with excuses to go and exercise on the sly, without having her hound me about my fitness assessment. Oh joy! Luckily my friend came with me and saved me from what might have been the first fitness club murder in my neck of the woods. She proceeded to show me how to use the menacing equipment that lined the walls. I’ve had nightmares in which I’m flying off those things in mid-stride with nothing to hold on to but the sports bra straps of the unsuspecting woman exercising furiously on the machine behind me. All in all, it was a morning unmarred by catastrophic events, but there’s still time. I plan to go back, so all I can say is watch out people. First of all I must apologize for being so late with my response. 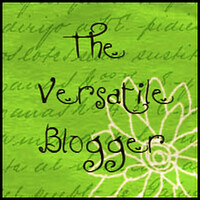 I want to thank Natasha over at http://tashastraveltroves.com for nominating my blog for this award. Her blog is amazing, so please go and check it out. It’s a great feeling to know that out there in the vast blogosphere there are people who enjoy my ramblings. I’m also thrilled by the fascinating people I have “met” since I started blogging a few months ago. 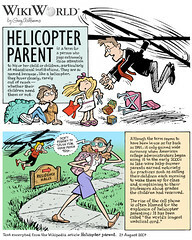 Helicopter Parenting: How much is too much? As parents we often have to tread carefully to avoid stepping on the fine line between good parenting and over parenting. How do we know when enough is enough? Is there a magic age when we can say that we have done all that we could for our children and that the time has come to step back? I thought I was a helicopter parent. I hovered in preschool, in elementary school and would have continued to hover in high school if I had not walked into that invisible wall as my oldest daughter went off to her first day. It wasn’t an actual wall that stopped me…it was a look of sheer horror and embarrassment on my daughter’s face as she realized that I was stepping out of the car and following her. That look stopped me in my tracks. I realized that I had gone as far as I could. I stood outside her school like an abandoned child for a few minutes, before it hit me. This was it. No more greeting the teacher as the kids walked in and hanging around the classroom if they needed parent helpers. Apparently, once your kids hit high school, parent helpers are synonymous with the plague. I realized that I needed to get a life of my own, hence the desire to start a career as a writer. Also, I had some time to transition since I had another child and her teachers to harrass for a few more years. Which brings me to the article about helicopter parenting. Apparently it is a real affliction. It seems that there are parents out there who haven’t heard of the invisible wall I was talking about. And if they did, they may have just crashed through it anyway. I’m not judging because I know I’m just as guilty of hovering, but I do draw the line at calling my children’s prospective employers or future university profs. But extreme hovering tactics aside, when do we let go? Do we deprive our children the benefit of our experiences and failures and allow them room to make their own mistakes? Is it hyper-parenting to want to spare your child the disappoinments that you have faced and give them an edge? I don’t have the answers, but I do know that it is a daily struggle to decide when to step in or back off. After all, it is our children’s future that’s at stake. Author sabina khanPosted on March 8, 2013 March 8, 2013 Categories adulthood, blogs, Childhood, Fiction, high school, humour, India, indie authors, Mythology, parenting, Publishing, queries, rejection, self publishing, SIWC, Teenage, Uncategorized, writing, YA Paranormal FantasyTags action/adventure, children, Elementary school, Fiction, Helicopter parent, High school, indie authors, Parent, parenting, parenting styles, Publishing, self publishing, teensLeave a comment on Helicopter Parenting: How much is too much?